Coming up with killer employee newsletter ideas can be tough. You’ll Google “best employee newsletter examples” but won’t really find anything captivating. Like all communications, the best employee newsletters are relevant, entertaining and interactive. While the dissemination of information is an important task, if you don’t remember to be engaging, your employees won’t pay attention. 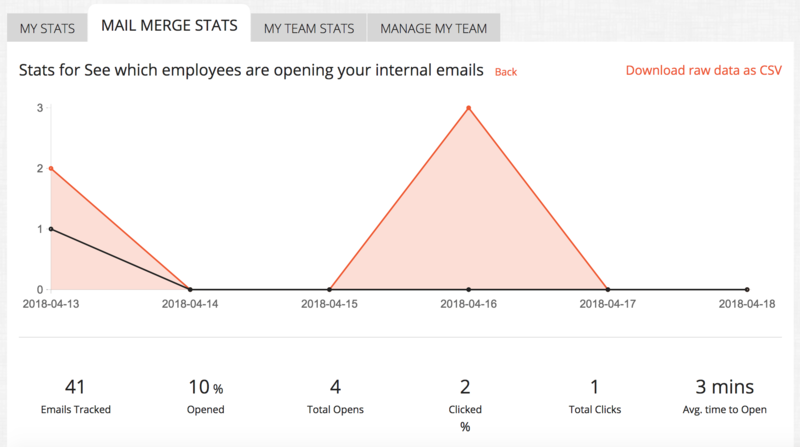 Not only is it hard to get your employees to open emails, even when they open it, if your newsletter is missing that wow factor, your audience won’t engage with it and the worst will happen: they’ll hesitate to open any future internal newsletters. I know, it’s unfair. We feel your pain. But at the same time, as the person creating the company newsletter, it’s on you to make sure that your internal newsletter is irresistible. Think about how people rush to the kitchen for cake every time there’s a birthday. Did you have to force them? Did you have to beg them to get up and go all the way to the other side of the office for a sugary treat? Your internal communications need to be better than birthday cake! Your fun content is the batter, and your newsletter template, the icing. Is this metaphor … crumbling? (Sorry ?). Here are 5 killer internal newsletter ideas that will help you steal your employees attention, leaving them craving for more (and no calories!). As an internal communications pro, you need to tap into people’s egocentric (or healthily self-loving) nature by featuring them in your communications. Think about the first thing you do when looking at a picture you’re tagged in. That’s right, your eyes go straight to where you are. Who are you next to? Who cares! As long as you look awesome, it’s a good picture. As an internal communications pro, you need to tap into people’s egocentric (or healthily self-loving) nature by featuring them in your communications. The best way is to feature people beyond your communications by giving them a platform to make themselves heard and influence the organization. A great way to do this is to let democracy decide the fate of fun company activities. Not sure which beer we should order for the office social? Survey people and put it to a vote! Not sure whether to get Mexican or Indian for Friday lunches? Put it to a vote! Employees will engage with your communications if they see it as a two-way street where both parties get a say. More importantly, if your internal emails get them closer to chips and guac, your open rates will go through the roof. Expanding on the fact that people like being heard and noticed, another way to boost employee engagement is to have a “Recommendations From Your Team” section in your internal newsletter dedicated to employee-submitted recommendations for restaurants, TV shows, books and music. Although who we are goes more deeper than what we like or the content we consume, as humans we love showcasing the stuff we enjoy consuming so helping your team do that with your internal newsletter is a no-brainer. When was the last time your recommended a new Netflix show to a friend? How good did it feel when they actually watched it? Remember to always focus on the humans behind the stories, not on mere facts. I don’t know about you but I love praise. When I get a “great job!” or “nice work” from a colleague it means the world to me. Imagine how your employees would feel if you showcased their wins at an organizational level? A great way to boost engagement and morale is to have a recurrent section of your employee newsletter dedicated to team spotlights. Who’s killing it lately? Did sales hit their quarter? Every week/month you can focus on a different department, highlighting who they are and what they’ve accomplished. Remember to always focus on the humans behind the stories, not on mere facts. At an individual level, you can create an employee profile section where, every week, you introduce someone in the organization. Who’s Pete from IT? What does he like and what does he do for fun? Employee profiles are a great way to make your internal newsletters more fun while boosting morale and performance, since a team that knows each other well, performs better. 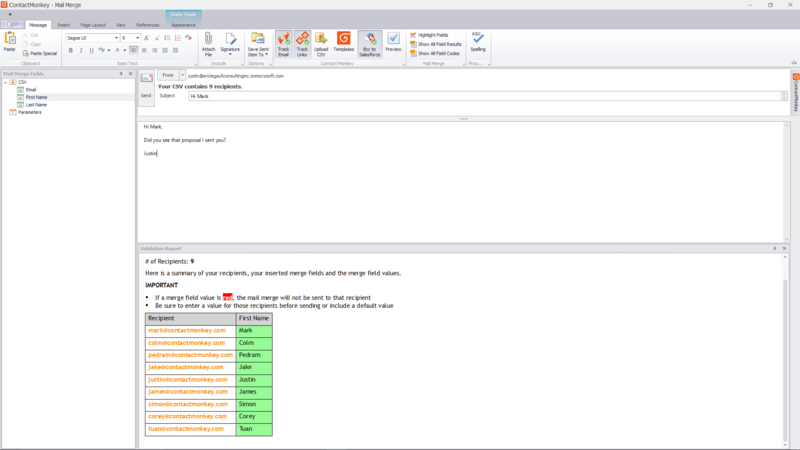 Subject lines that are personalized are 22% more likely to be opened. Even as an email expert and trained marketer, I still like the personal touch of “Dear Ali,” in a subject line or body of an email that I know is a mass email or a mail merge. And I’m not the only one. According to Aberdeen, personalized emails improve click-through by 14% (and conversions by 10%). 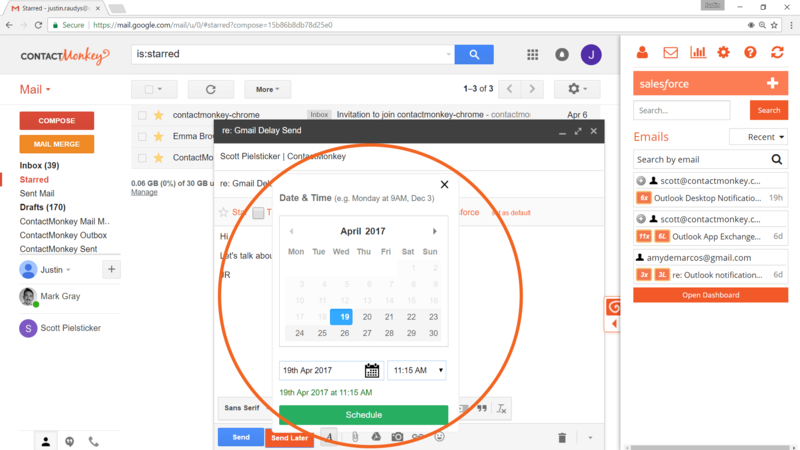 On top of that, subject lines that are personalized are 22% more likely to be opened, according to Adestra. What that means is that you better get personalizing now! 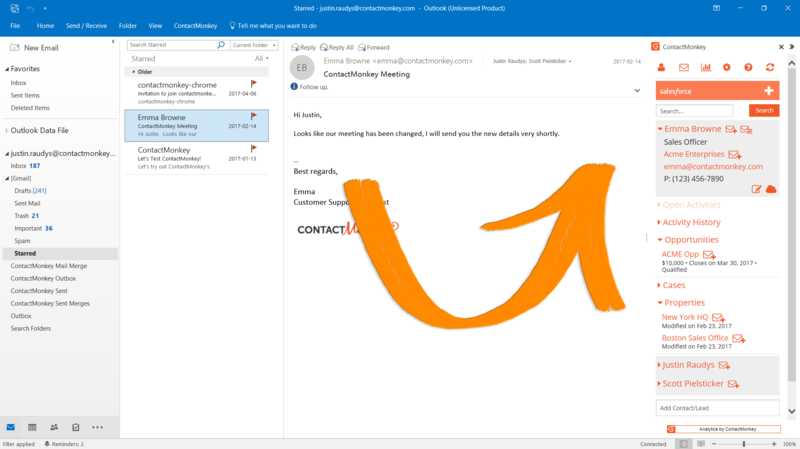 If you’re sending your responsive HTML employee newsletter in Outlook, with ContactMonkey it only takes one step to personalize your subject line. 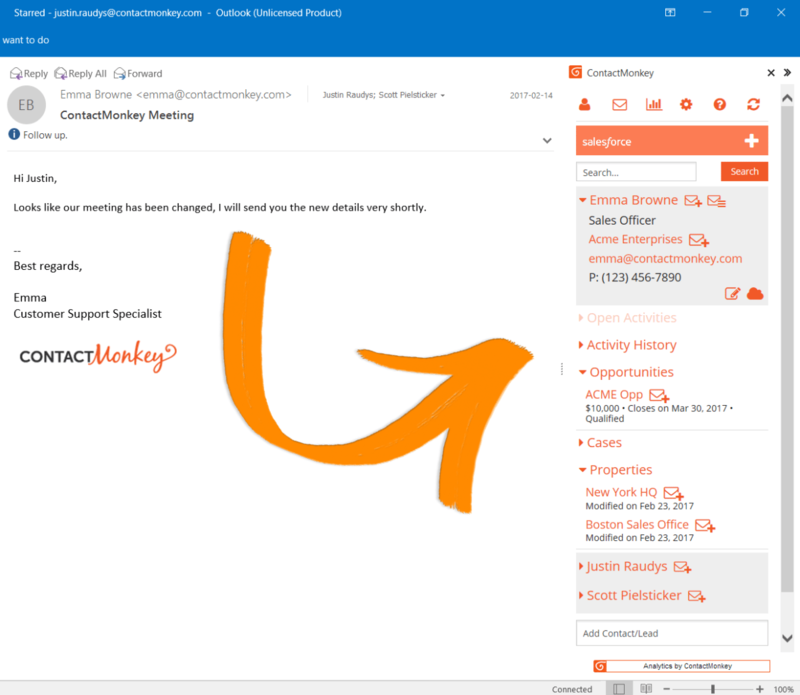 Within the ContactMonkey Mail Merge picker (on the left) click and drag any merge field you would like to use into your subject line (probably “First Name”). 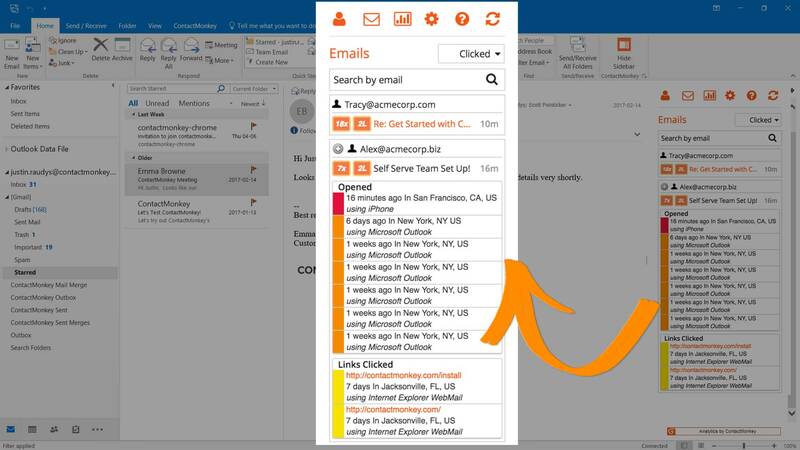 To personalize the body, make sure you add the respective merge field in your HTML file before uploading to Outlook. 5. Be a Human, Employee Newsletters Can Be Fun Too! The bottom line is to send emails that you would like to get. Although 99% of the time internal communicators are busy using internal comms to lead within their organizations and influence employees to perform better, a little fun actually boosts engagement! A good idea for your internal newsletter is to add a section where you can share funny memes, videos or random anecdotes. I mean, your employees are already spending countless hours watching FailArmy videos and funny Vines, you might as well get in on the fun. To make it even more interactive, make a game out of it! A fun game that I’ve seen work is to have employees guess which movie X quote is from and the person who replies the quickest with the right answer, gets a Starbucks gift card. The bottom line is to send emails that you would like to get! Add memes that you find funny (work appropriate always, of course), and give people the attention you’d like to get whether it’s through a profile or through featuring their recommendation in your internal newsletter. What have you seen work in the past? Is there a section of your newsletter your employees love? Let us know in the comments below or tweet us!